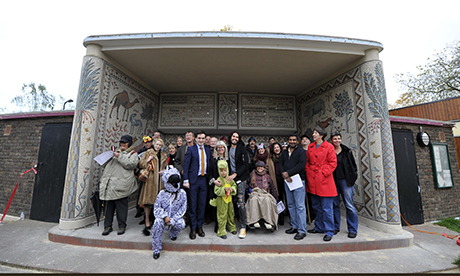 An impressive new mosaic by the Hackney Mosaic Project has been unveiled at Hackney Downs Pavilion. The mosaic project works with volunteers, some from the local community and others referred by Lifeline, a charity which helps people recovering from addiction problems. Led by artist Tessa Hunkin, the volunteers created the “roman inspired” mosaic in the Hackney Downs playground shelter as part of a 9-month long project. Made from glass and ceramic tesserae, the mosaic depicts an animal pursuit, beginning with a mouse startling an elephant which sets off a chain reaction involving lots of different creatures. Comedian and activist Russell Brand surprised volunteers by turning up to help Councillor Jonathan McShane unveil the mosaic. Cllr McShane said: “The volunteers have worked with extraordinary dedication and care, coming together to create a really beautiful work that will be enjoyed by local people for years to come. This is the third mosaic project to be funded by Hackney Council. Previous work can be seen at Shepherdess Walk Park, and at the corner of Old Street and Pitfield Street – recently announced as winner of the Mosaic of the Year Award for 2014 by the British Association of Modern Mosaic.